When I was writing about Natalie Clein’s fabulous new recording of the Elgar Cello Concerto (EMI 5014092 - see review) I moaned at her coupling of symphonic arrangements of some of Elgar’s salon pieces. I secretly wished that she had paired the work with either the Havergal Brian Cello Concerto – a lovely piece fully deserving of our attention - or the William Busch Cello Concerto which, although I’d never heard it, I expected to be something fine. Half of my wish-list is now complete! 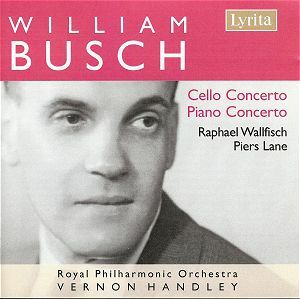 William Busch was much admired by Vaughan Williams, Tippett and Finzi, but just as he was establishing a reputation as a composer he died, of a brain haemorrhage, his body undiscovered for several days, aged just 43. I won’t recall his life story for, elsewhere on this site, there are fine articles by Julia Cornaby Busch, the composer’s daughter and by Sinclair Logan, which are all you could hope for regarding this interesting composer. Since his early death one wonders if perhaps the neglect of his music is due to the fact that his work is more cosmopolitan than most English composers working at this time. He studied in America and Germany - his parents came from that country - as well as at the Royal Academy of Music in London. He didn’t have the time to fully realise his potential. Also, only a handful of his works were ever recorded: four songs each, by Henry Cummings on 78s (DECCA m 576 (10”)), Peter Pears (originally DECCA ZRG 5439/RG 439 (1965) re-issued on Belart 461 5502 (1997) and one by Janet Baker (originally HQS 1091 (1967), re-issued on EMI CDM 565009-2 (2000)). This latter recording of Busch’s setting of Æ’s (George William Russell’s) poem Rest was my introduction to this composer. In 1990 BBC Radio 3 broadcast a programme of Busch’s chamber works – including the magnificent Piano Quartet in G minor (1938/1939) and the Nicholas Variations (1942). The latter was named for his son, who was, for many years, principal horn with the London Philharmonic and is the superb soloist in the recording of Britten’s Serenade with Ian Partridge (in fine voice) with the LPO, conducted by John Pritchard (EMI Classics for Pleasure 5759782). That is all the majority of contemporary music-lovers will know of Busch’s fine art, so this new disk is all the more valuable. The Cello Concerto, although written in wartime, is an intensely lyrical work, beautifully conceived for soloist and orchestra. Busch certainly could orchestrate. The nearest we get to the English Pastoral school is in the slow introduction to the first movement, a stately and elegiac cadenza where the soloist is joined in his musings by the orchestra. It’s not long before we’re on a roller-coaster ride where themes flit to and fro - not long singable melodies but fleeting ideas of a few notes duration. The music dances, jig-like, tinged with a hint of sadness. The slow movement is a pastoral meditation, but not a specifically English pastoral, more, I feel, a meditation for the loss brought about by war, and a remembrance of things past. One brief climax interrupts the cello’s sorrowful song. Much of the music of the finale is under clear skies, boisterous and virtuosic, with only the occasional cloud obscuring the view. Then a race to the end. It’s all over far too quickly. This Concerto is a masterpiece and we must give great thanks to Lyrita for giving it to us. The Piano Concerto is a different matter and it comes as a shock after the Cello Concerto. The first movement is full of delightful chatter, starting with, and returning to, neo-classical - no fat on the meat, as John Amis writes in his notes - passagework for the soloist. It’s full of high spirits, and again, is not without the odd moment where dark clouds obscure the landscape, but it all ends in good humour. The slow middle movement is another pastorale, with beautiful dialogue between soloist and orchestra – and some ravishing oboe solos. The finale is a set of variations, which contains some very challenging music and events. It’s also a very serious affair, which puts it at odds with the other two movements, but it’s the right movement for the work: this Concerto couldn’t end any other way. As with the Cello Concerto, Busch’s conception is highly intelligent and very well conceived, and, although it’s obviously a virtuoso piece, the solo writing is never “showy” for its own sake. Might I make one suggestion? The emotional power of the Cello Concerto is such that playing the Piano Concerto immediately after does the latter work a great disservice. When you’ve listened to the cello work, stop the disk, give yourself some breathing space, make a cup of tea, drink it, then listen to the Piano Concerto – you will enjoy it all the more. That certainly worked for me. This is music of a highly personal nature. True, there are moments - and only moments - where one might say, “Oh that sounds like…” but Busch has forged his own style and he transcends his influences with ease and his undoubted skill and talent. An excellent recording, clean, bright and clear, with first-rate balance between the superb soloists and orchestra, which is in the most capable of hands for this music. John Amis’s very informative, and personal, notes in the booklet complete one of the very best issues ever to come from Lyrita. Buy it. Cherish it. Let’s not let this fine composer disappear from our sights ever again.